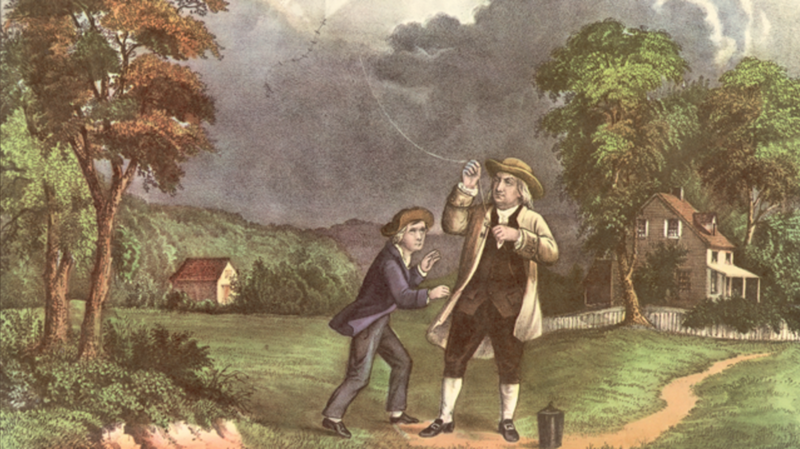 In elementary school, most of us were taught that Benjamin Franklin discovered electricity by tying a key to a kite and standing in a thunderstorm. Though Franklin is believed to have completed his lightning experiment, he wasn’t the first to do so. Nor was he the first scientist to study charged particles. Sorry everyone, your childhood science teacher sort of lied to you. So let’s clear things up. Founding Father/diplomat/inventor/innovator/Philadelphian/total cad Benjamin Franklin became interested in the field of electricity when his friend and fellow scientist Peter Collinson sent him an electricity tube. Franklin investigated how charged objects interacted and came to the conclusion that lightning was merely a huge spark that was created by charged forces. In this early phase of experimentation, Franklin concluded that electricity was fluid. It was during this time, in 1750, that Franklin sent Collinson a letter proposing an experiment that would draw lightning through a 30-foot rod. He not only hypothesized that lightning and electricity were linked, but that metal objects could be used to draw lightning in order to protect homes from being hit. But Franklin didn’t feel that he could get his conductor high enough into the clouds to do any good, so he never completed the experiment. Instead, in 1752, he devised a new plan: sending a kite into the air. Little did Franklin know that his original letter to Collinson, once translated to French, was causing quite a stir in Paris. To test Franklin’s hypothesis, naturalist Thomas-Francois Dalibard used a large metal pole to conduct electricity from lightning on May 10, 1752. In Dalibard’s writing of his Paris experiment, he concluded that Franklin’s hypothesis was right. It was exactly one month after the Dalibard experiment, on June 10, 1752, that Franklin (supposedly) performed his famous kite and key experiment. Franklin stood outside under a shelter during a thunderstorm and held on to a silk kite with a key tied to it. When lightning struck, electricity traveled to the key and the charge was collected in a Leyden jar. Here’s the tricky bit—there is a lot of doubt between historians as to whether or not Franklin ever conducted the experiment. In October of 1752, Franklin wrote a brief statement in the Pennsylvania Gazette saying that the iron rod experiment had been achieved in Philadelphia, but “in a different and more easy Manner,” with a kite. But as his previous thought experiment was being replicated across the continent with great success, this was only of minor scientific interest and Franklin never really elaborated on it. Also, he never said that he was the one who did the experiment. It only became a story 15 years later when Joseph Priestley wrote a full description in which he describes Franklin as bringing “lightning from the clouds” to the ground. As modern scientists have come to discover, if Franklin had performed the experiment as delineated in Priestley’s account, Franklin would have been struck dead on the spot. In his 1752 article, Franklin claimed you could touch the key and feel a spark; however, that much charge would have sizzled his insides. But other historians read his original statement in the Gazette and think it’s been misinterpreted. Instead of getting hit by lightning, the kite just picked up the ambient electric charge—Franklin was lucky that his kite never got a direct hit. So, while we can credit Franklin for writing up the experiment that posits whether lightning is the same as electricity and can be drawn through metal, he was not the first to actually perform said experiment and write about its results. In fact, there are few sources that can prove Franklin ever did the kite experiment at all—we have to trust his word that it happened.